Posted on March 29, 2011, 2:23 pm, by admin, under New Projects, Recent News. Glenwood Country Club in Old Bridge, New Jersey recently installed a custom M54 Trailhead on its newly renovated course. In order to harmonize with the aesthetics of the course, stone and clapboard exterior and a metal roof were added to a pre-fabricated structure. 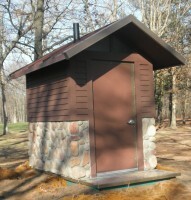 The new composting restroom will offer comfort to golfers at the farthest reaches of the course with a waterless urinal and 6 oz. Foam-flush toilet.